Is your company in the business of serving customers… any type of customers, in Bangkok? If so, do you really know the impact of logistics costs on your profits? Many companies don’t. In this short article, I’m going to explain why not knowing the cost to serve (CTS) is a mistake that could be limiting the profitability of your business operations in Thailand. 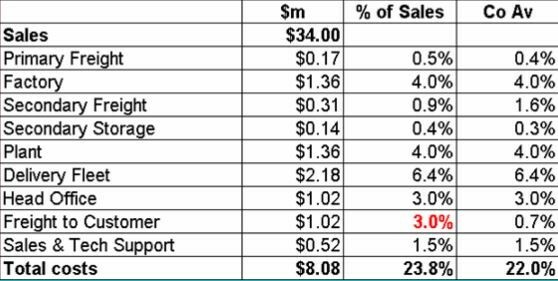 Statistic: Logistics costs as a percentage of sales are typically in the region of 9% to 14%. You see, the costs you incur in running your supply chain make up a significant part of your overall business expenses, and in Thailand, there are plenty of logistics challenges that, left unaddressed, may be costing more than you realise. Bangkok in particular, is an area that logistics operators know to be expensive in terms of transport and distribution. However, if your company is a buyer of warehousing and logistics services, and you don’t have the necessary insider knowledge, how can you be sure you’re paying a fair price for logistics services in and around Bangkok? I’m not suggesting for a moment that your 3PL or carriers are taking you, as well as your freight for a ride. In fact, the information in this article is just as useful to logistics providers, especially those that have not completed their own CTS analysis. Statistic: Trucks with 10 or more wheels are banned from inner Bangkok between 6am and 10am/3pm and 9 pm. 6-wheeled trucks are banned between 6am and 9am/4pm and 8pm. The important thing to understand about logistics in the Bangkok region, is that city congestion and a tight restriction on trucks in the metropolitan area, combine to make it a challenging environment for transport operators especially—and that is naturally reflected in the costs that affect your margins. In fact, the concern about cost to serve in Thailand should not be limited to businesses serving Bangkok. If your company’s distribution network covers any location within Thailand’s borders, a CTS analysis will reveal a lot about how your supply chain is affecting revenue and profit. 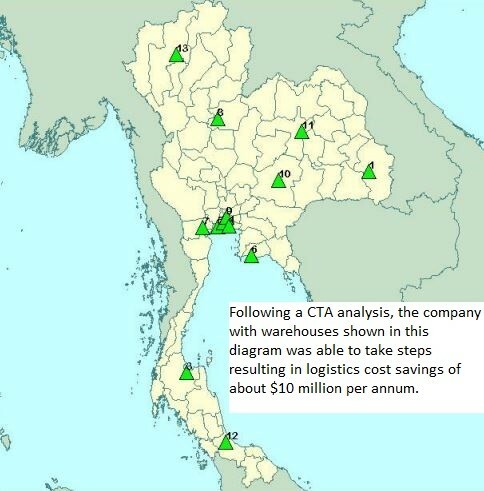 For example, while working with one of our clients, a consumer products company with 13 warehouses located around Thailand, we conducted a CTA analysis. The results showed inordinately high costs associated with the supply of smaller orders, delivery to small customers, and especially with the distribution of goods from Bangkok (where the client is based) to seven warehouses located in far-flung regions of the country. As a result, the company closed those warehouses and transferred local supply to third-party distributors. Along with a number of other initiatives born from the analysis findings, the rechanneling of the company’s products in this way delivered a cool 20% saving in distribution costs. If you think you really understand your distribution costs in Bangkok and elsewhere within Thai borders, but haven’t actually analysed cost-to-serve, it might be time to think again. 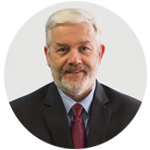 When companies conduct their first CTS analysis, the findings are often surprising. CTS analysis breaks down your supply chain costs and reveals them at a more granular level than other costing techniques such as top-level averaging, and while complex to perform, is a more pragmatic way to show supply chain costs than the more commonly used activity-based-costing (ABC) approach. CTS can show you which products, customers, and channels provide you with the most (and the least) profit. This is why it can enable you to see the effect of issues like congestion and truck bans in major cities such as Bangkok, or inefficient asset utilisation in rural distribution. What Can You Do with CTS Findings? Once you’re able to see exactly which products, customers, and channels are incurring comparatively high costs, and the composition of the cost drivers, you’ll be able to identify and implement measures, either to reduce the associated costs, or to make informed decisions about pricing. The findings from CTS analysis can be used as a basis for improvement-steps ranging from relatively simple activities, like investigating freight charges and attempting to negotiate reductions, to much more complex initiatives, such as reevaluating the locations of warehouses or other distribution nodes. Changes in the mix of transportation modes used. These are just a few examples, and in each case, the companies were unaware of the cost-reduction opportunities prior to CTS analysis. If your company is Bangkok-based and most of your customers are in that same region, CTS analysis may show that costs are favourable. However, without the analysis, it’s probable that you won’t know, which means you could be missing opportunities to get your logistics costs down and improve profitability. If you’d like to find out how Logistics Bureau can help you understand your cost to serve Bangkok customers, and those elsewhere in Thailand, give us a call at + 66 2207 2680. A member of our Thailand consulting team will be pleased to discuss your needs.